Metro Divider Boxes. 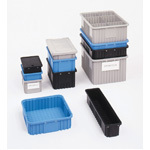 The Metro tote box line offers safe and efficient storage of items in bulk or in compartmentalized trays. Totes come in natural grey, Bentron (Black) or Benstat (Blue) for electronics protection.